On September 1st, 2017, Vincent Munyeshyaka and other 27 appointees woke up ready for a very important function – The Swearing in Ceremony at Parliament. President Paul Kagame as per procedure and protocol would preside over this special session in parliament. The new appointees had already been confirmed by the Cabinet and had duly prepared for this ceremony accompanied by their families and next of kin. Of the appointees, 18 were full ministers and 10 state ministers. In taking Oath, they walked forward, held the National flag with their left hands while raising their right hands and read out the oath of allegiance both to uphold the constitution and diligently serve the country and asked God to help them. When Munyeshyaka started his new job as Minister of Trade and Industry; he requested to first visit the industrial project in Rwamagana district that targeted to create about 5000 jobs. Rwamagana is 30 minutes’ drive out of Kigali city and this was a doable visit for the new Minister. He drove to the site accompanied by various officials from different departments. 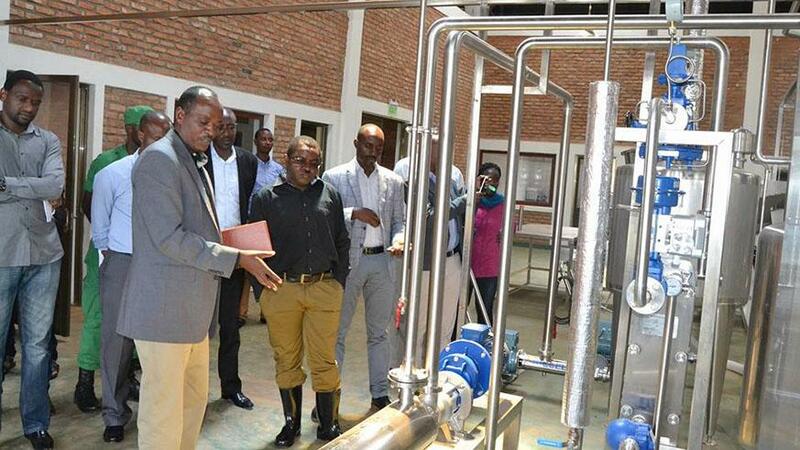 The Minister was given a guided tour of the industrial park but when he reached at the Rwamagana Banana Wine CPC Factory, something didn’t seem right. The Industrial Park site has ten factories; seven factories are not complete while only 3 are fully operational. Technical experts explained bit by bit about the construction, equipment and business model of this Banana wine plant. The minister did not seem impressed at all by this project. Taarifa thus took keen interest in this project and has for this long haul been investigating most of the issues raised during the minister’s visit to the site. Water accessibility – the experts argue that the designers of this Factory had planned to have water pumped from Lake Muhazi but nothing to this effect has been implemented. According to the same experts, it would cost almost Rwf 400million to set up a water pumping system from Muhazi to the factory site. There is no budget for this water supply whether by the district, Ministry of Finance, Ministry of Trade and Industry and not even Infrastructure ministry. Experts also argue that the Factory in its current status will never take off because it has been badly misappropriated before construction and even before its business plan was drafted. According to National Industrial Research and Development Agency (NIRDA) the government of Rwanda wants at least every district to have industrial capacity. Experts were required to traverse the country and collect information on resources. A factory would thus be built in a particular zone with the aim of adding value to the abundant resource. For example Rwamagana district was found to have high concentration and viability of Bananas. Thus it was prudent to build a banana processing factory there. The implementing agency is the Community Processing Centre (CPC). Government budgeted for every factory a tune of Rwf500million but in every district there would at least be two factories meaning a total of Rwf 1 billion was allocated to every district. An inquiry into the Rwamagana Banana CPC factory indicates that its construction was completed in December 2016 at a cost of Rwf435million without equipment. The processing equipment were budgeted for Rwf630million. The processing machines arrived in June 2017 but have never been tested and are still redundant. The combined value of this Banana processing factory is now valued at Rwf1.065billion- this is more than double the required budget of only Rwf 500million. Taarifa has also learned that the equipment do not make a complete kit as was proposed in the tender document. It was also discovered that specifications of the equipment delivered by the supplier from Spain did not correspond to those proposed in the tender document. Experts who are well conversant with factories of this level told Taarifa that Spanish technology does not deliver well in such project. “Spanish Agro processing technology cannot deliver the desired results as per government of Rwanda requirements in the Banana processing factory,” an expert said on condition of anonymity. Taarifa has also discovered that during the process of implementing and realising the Rwamagana Banana CPC, it was very important to consult with Banana Processing Cooperative but this was ignored. The idea is that government builds the factory but it gets operated by the Cooperative which eventually takes it over completely and gives government effort to startup another different factory in the drive to industrialisation. Until today the Banana Processing Cooperative has never been consulted by those implementing the Rwamagana Banana CPC yet the cooperative has expertise and experience. Taarifa has also learnt that structures that were planned to support the main factory building have never been built. At the time when Minister Munyeshyaka Visited the site, the factory was evidently leaking, there is no waste drainage system and that the facility also lacked waste water treatment system. Meanwhile, another Rwf 500 million has been budgeted for by NIRDA allegedly to complete construction of the factory and buying the missing machines to complete the Kit. When this money is released, the entire project will be valued at a massive Rwf1.2billion + Rwf500 which is equivalent to Rwf1.7billion – this is the cost of building almost four factories of similar size as specified in the government district industrialisation plan. Definitely the visit to Rwamagana Industrial zone by Minister Munyeshyaka changed his entire expectations. He drove back to Kigali not a happy man. However, when Minister Munyeshyaka was in Rwamagana he noticed something – the Director General of NIRDA Kampeta Sayinzoga was not present. A not so happy Minister demanded for answers from Kampeta asking her to give a road map within two weeks showing how all the issues identified at the Rwamagana banana factory will be solved. The road map was quickly assembled and delivered to the Minister. However, in practice the experts on site say nothing is being implemented despite the road map. A closer review of the procurement process, tendering and the people involved could point to why this project was eaten even before it could germinate. One pointer is the technical specifications provided in the tender document were prepared by a division manager who does not qualify for such a task. An expert who examined the tender preparation noticed that the person who prepared the specifications holds a fake Curriculum Vitae (CV). It is also alleged that there must have been an issue of an insider colluding with the Spanish supplier to deliver factory equipment valued at Rwf1.2billion. Yet there could have been better equipment from countries with highly developed technologies. It was also discovered that this entire Banana Processing project did not have a Business plan both at the time of inception and after the factory site was developed. The expert found that there are two Business Plans drafted after the Factory and equipment were already delivered. However, in September 2016, NIRDA had issued a tender 18/S/N/NIRDA-OB/2016-2017 to hire a consultant to revise the business plan. Insiders privy with information say that Rwanda Investigations Bureau has been critically examining this project right from its tendering process up to implementation. Despite the fact that Taarifa zeroed in on the Rwamagana Banana processing factory, there are other similar projects that require urgent scrutiny. For example the Burera CPC Diary, Nyabihu Potato Company, Rutsiro Honey CPC, and Nyanza Ceramics CPC Company. Experts say these projects are not viable and have been tampered with before, during and after implementation.